Clicking this download button begins your installation ConverterLite. Additional software may be offered to you via opt-in ads during the installation process. Clicking the download button begins installation of InstallIQ™, which manages your ConverterLite installation. Learn More. You may be offered to install the File Association Manager. For more information click here. You may be offered to install the Yahoo Toolbar. – Free software that uses the powerful FFmpeg project to convert audio and video files quickly and simply. 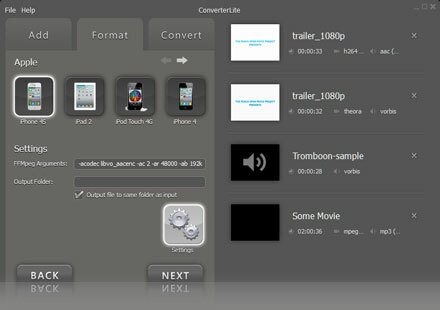 – Convert Audio and Video files for your iPhone, iPad, Android smartphone, PSP, PS3, Blackberry and more! – Batch conversion for many files needing to be converted. – Simple interface format, just select the files, choose a format and click convert. – Can be used in English, Spanish, French, Chinese, Russian, Dutch, Japanese and many more languages. – Available for Windows 7, Windows Vista and Windows XP. 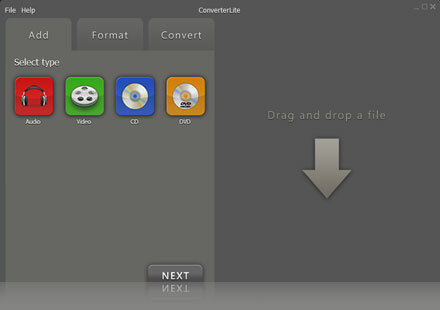 ConverterLite can convert pretty much any format under the sun including: MP3, MP4, WMA, WMV, WAV, AVI, VOB, FLV, MOV, XviD, H.264, AVCHD, MPEG, OGG, AAC, FLAC, QTS, QuickTime Audio, Real Audio, M4A, AC3, PCM, MP2, Vorbis, M4V, DVR, and many more!